Benchmark Finishing has been a trusted name in the Ottawa area since 1999. We offer a full range of services specializing in hardwood flooring with professional installation and refinishing services. We are also an accredited member of the Better Business Bureau. 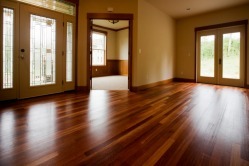 It is well known that hardwood floors not only increase the value of your home, but they add warmth, and style as well. Equally important is the fact that they are easy to care for, durable, and they make for a safer, healthier environment.